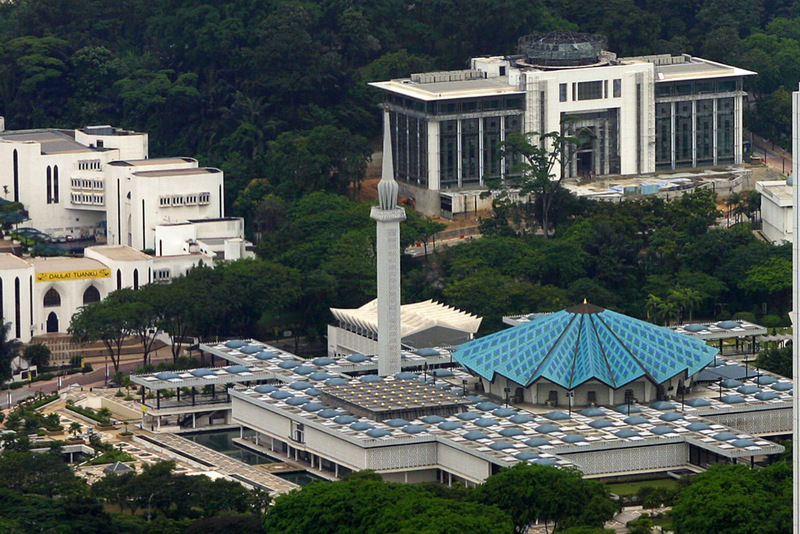 Malaysia is inhabited by three main ethnic and many other races that also characterized the excitement of this country. Even so not many of us who spend the time to learn more about the synagogues of other races respectively, but it was a good effort to foster more understanding between people and bridge the closeness of friendship that already exist. Visits to synagogues another race is not a prohibited. What important is we must follow the guidelines and respect for the place worship of other races. So learn the proper way before entering the synagogue - and make sure you respect their synagogue fit as you want them to respect your synagogue. You are also encouraged to visit it at the suitable time in order to avoid any disturbing while other conducting their religious activities. The interior of the National Mosque. The mosque is decorated with water fountains. Kuala Lumpur National Mosque is the main mosque for the Muslim population in Kuala Lumpur was built with the architecture symbolizes Islam with many unique features of its own. This mosque is able to accommodate up to 15,000 worshipers at any one time. 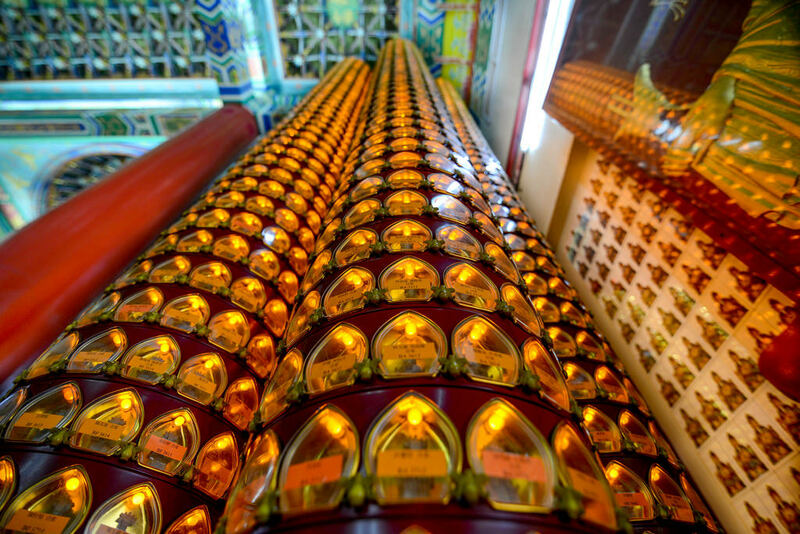 It has unique dome that has 18 facets representing the 13 states in Malaysia, while the 5 pillars also symbolize the 5 pillars of Islam. There is a minaret that houses the speakers as high as 74m, which allows the call of prayer to be heard from a wider area. For travelers who want to visit the National Mosque, the time of the visit was made after prayer time. Suitable clothing also available and guides for areas that can be visited are also available. Visiting hours are as follows; 9:00am - noon, 3:00-4:00 pm & 5:30 to 6:30 pm. Friday morning it is closed for tours. Thean Hou Temple, a very beautiful temple. The pillars in the temple Thean Hou. It is one of the prettiest temples in the country. 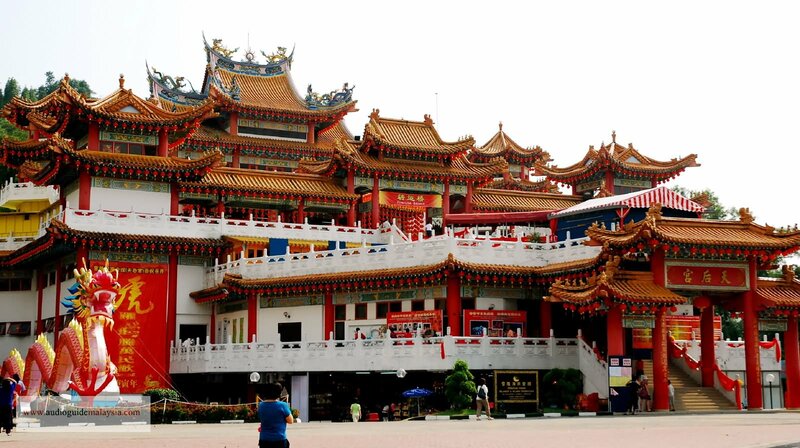 Thean Hou Temple situated in the high area of ​​Robson Heights, which also provides stunning views of the surrounding of Kuala Lumpur. 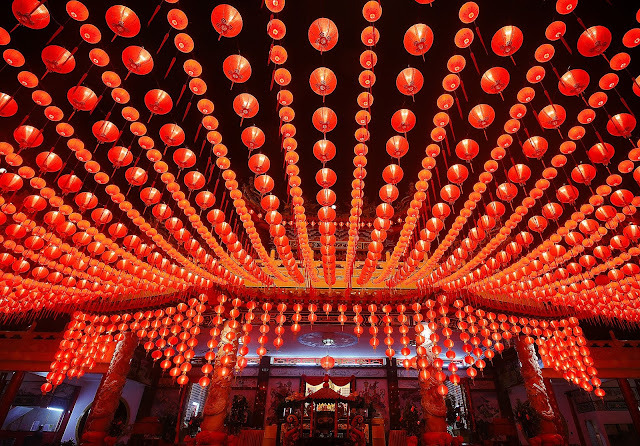 The best time to visit this temple is during the celebration of Vesak Day or during Chinese New Year celebrations. There are many interesting things to note here, in terms of unique architectural decorations are also available around this temple which is the Chinese zodiac sculptures, carved dragon and phoenix, and also other decorations that suit every room of the temple. 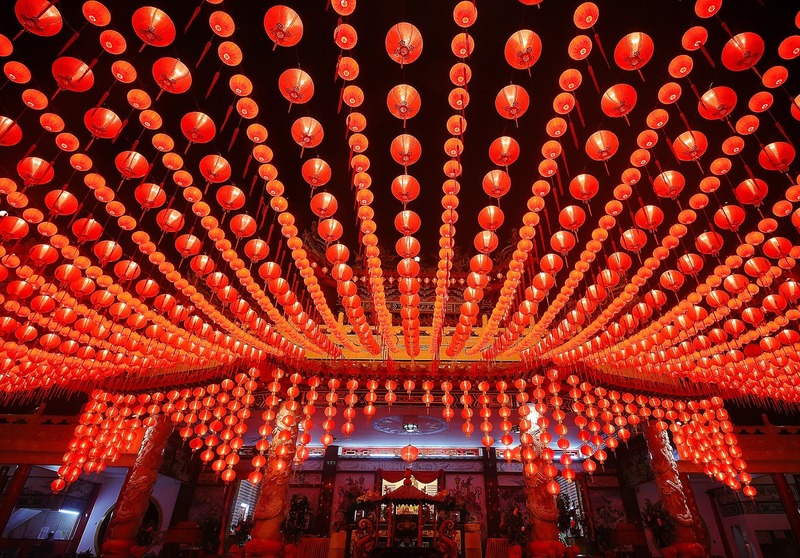 It is a large building with a main prayer room located on the 3rd floor which also houses statues of gods and goddesses that important to the Chinese. More unique features and things can be be learned here. The best time to visit this temple is between 9am - 6pm via the nearest monorail station at Tun Sambanthan. Batu Caves Murugan statue in front of him. 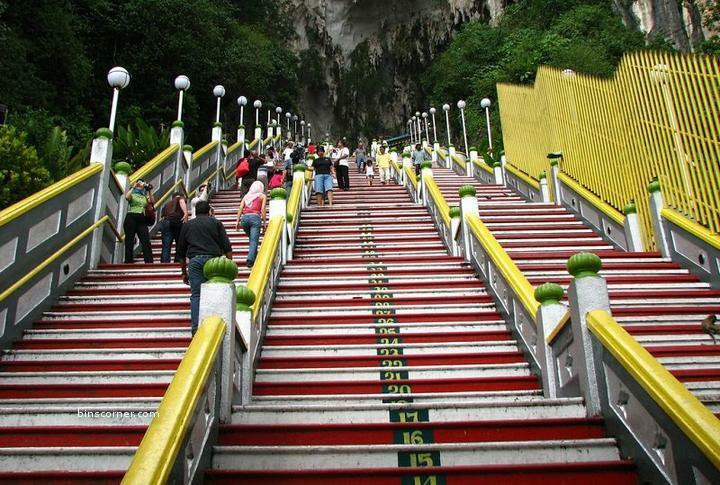 Stair climbing to the cave of Batu Caves. 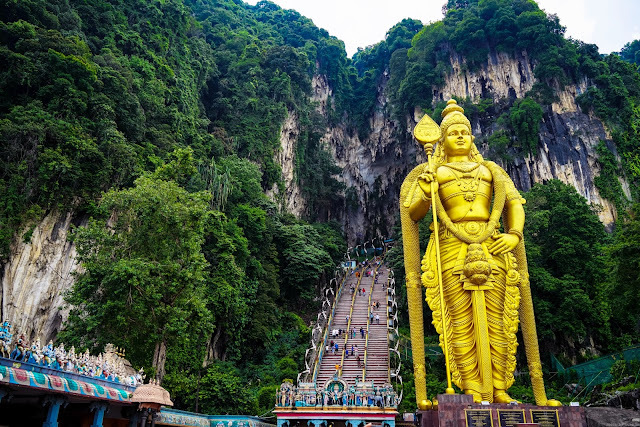 Batu Caves is a house of worship for Indians and also the largest in Malaysia. 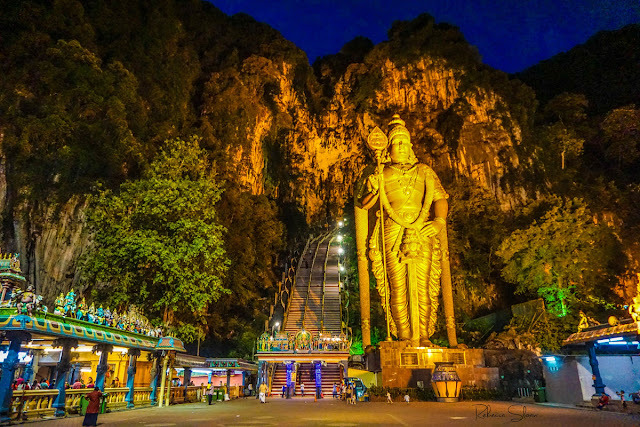 In fact Batu Caves has been used since 120 years ago. The most festive time to visit is during the celebration of Thaipusam every year, usually held in late January or early February for 3 days. One of the most interesting things about Batu Caves Temple is, it is located about 272 steps up to the top of the temple. There is also a giant-sized statue known as Murugan statue sized 42.5m with a golden color that is placed in front of the main road up to the stone cave. In addition to the main cave there are also other caves are open for tours (Dark Cave: www.darkcavemalaysia.com) with adult admission fee of RM35 / RM25 children: 10am - 5pm, Tuesday - Friday; 10:30 am - 5:30 pm Saturday & Sunday with a guide for every 20 minutes. This tour will take you to explore the cave and see the unique cave construction and together with their floras and faunas. The best time to the Batu Caves is between 7am - 9pm through a variety of transport options. Entrance fee to the Cave Temple is free but to other locations may be charged. 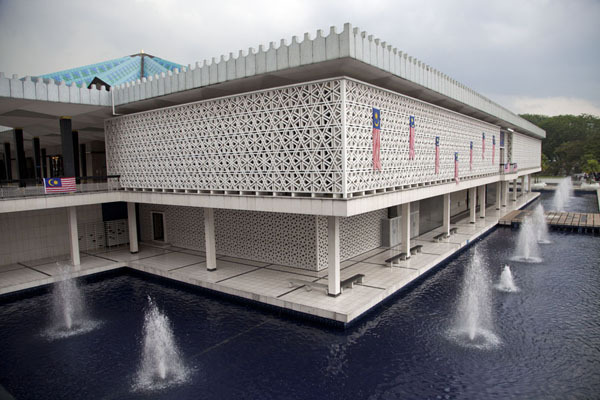 There are many more important synagogues around the city of Kuala Lumpur and you can visit it with permission from the administration/management. As explained at the beginning of this article, the purpose of the visit is to learn more about other cultures of other races, and you should respect these important areas during the visit. It is hoped that we take this opportunity to get to know each other more closely.